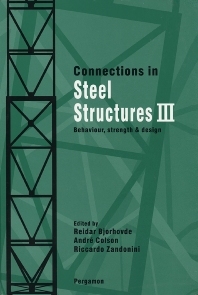 This book publishes the proceedings from the Third International Workshop on Connections in Steel Structures: Behaviour, Strength and Design held in Trento, Italy, 29-31 May 1995. The workshop brought together the world's foremost experts in steel connections research, development, fabrication and design. The scope of the papers reflects state-of-the-art issues in all areas of endeavour, and manages to bring together the needs of researchers as well as designers and fabricators. Topics of particular importance include connections for composite (steel-concrete) structures, evaluation methods and reliability issues for semi-rigid connections and frames, and the impact of extreme loading events such as those imposed by major earthquakes. The book highlights novel methods and applications in the field and ensures that designers and other members of the construction industry gain access to the new results and procedures. For engineers and researchers in the field of steel structures. Section headings and selected papers: Introductory Notes. Composite Connections. Finite element modeling of partially restrained beam-to-girder connections (C.O. Rex, W.S. Easterling). Prediction method for moment-rotation behaviour of composite beam to steel column connection (Ping Ren, M. Crisinel). Special Connections. Connection between steel beams and concrete filled R.H.S. based on the stud technique (threaded stud) (D. Vandegans, J. Janss). Seismic performance of CFT column-to-WF beam moment connections (J.M. Ricles et al.). The static strength and behaviour of multiplanar I-beam to tubular column connections loaded with in-plane bending moments (G.D. de Winkel et al.). Design Methods. Strength of moment end-plate connections with multiple bolt rows at the beam tension flange (T.M. Murray, J.T. Borgsmiller). Estimates of ductility requirements for simple shear connections (W.A. Thornton). Mechanical modeling of semi-rigid joints for the analysis of framed steel and composite structures (F. Tschemmernegg, G. Queiroz). Modelling of Connections. Modelling composite connection response (B. Ahmed et al.). Moment-rotation model of steel-to-concrete end-plate connections (L. Dunai et al.). Frame Behaviour. Characteristic semi-rigid connection relationships for frame analysis and design (D.W. White, Wai-Fah Chen). Influence of structural frame behaviour on joint design (S. Giusse, J.-P. Jaspart). Evaluation on static and dynamic structural coefficient of steel frames with semi-rigid joints via numerical simulations (D. Dubina et al.). Cyclic Response. Low cycle fatigue testing of semi-rigid beam-to column connections (L. Calado, C. Castiglioni). Post-earthquake stability of steel moment frames with damaged connections (A. Astaneh-Asl). Design Standards. Criteria for the use of preloaded bolts in structural joints (J.W.B. Stark). Design of fillet welds in rectangular hollow section T, Y and X connections using new North American code provisions (J.A. Packer). Requirements and capabilities for composite connections in non-sway frames (D.A. Nethercot). State of Practice. Strength and installation characteristics of tension control bolts (G.L. Kulak, S.T. Undershute). A review of connection research and development in the UK (D.B. Moore). Connections in Australia. Connection Research, Design and Practice in Australia (G. Hancock et al.). Current Research Needs for Connections in Steel Structures. Appendix.